January has traditionally been a very blah month. Business is usually slow, nothing much to do (except for one big thing at the end of the month!). To make a positive out of it, I am going to make new art in my pastel style. I sat and thought, "what do I want to draw? "........and looked back at my last piece. Alice in Wonderland, I'll do it again! Yes, my favorite. Maybe a series of them. What could be better? I thought of that crazy cheshire cat... and wikipeida-d him. Turns out the cheshire cat came before Lewis Carroll is an old english phase that describes someone who "is laughing, showing all their teeth and gums". Hmmm. The cat in Alice in Wonderland is quite the character, posing philosophical questions, having nonsensical conversations and disappearing!! Sounds like some contemporary people I know. There have been many variations on him, looking cute, silly and a bit ominous. I go for a cross between the ominous , interesting and intelligent, with a touch of silly. 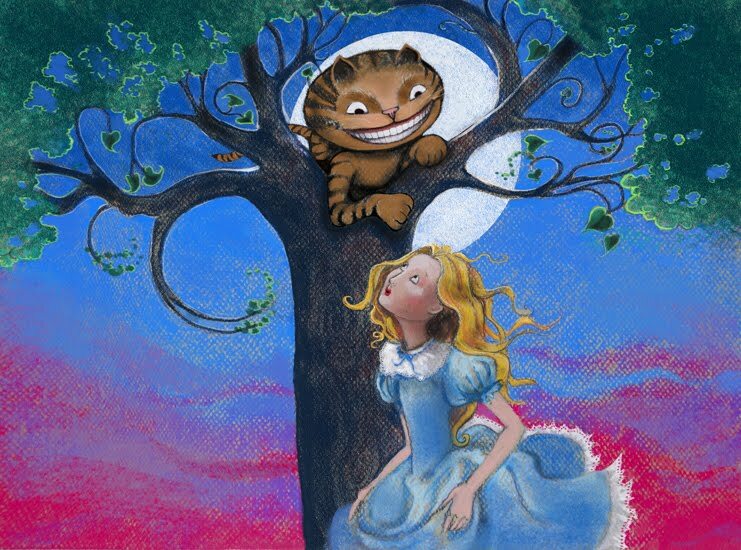 Here is my "Alice and the Cheshire Cat" as she first meets him crossing through a field.